The ketogenic diet is based on eating foods high in fat, moderate in protein and very low in carbohydrate. KETOSYS™ is a nutritionally balanced supplement with 70% of calories from fat, 20% of calories from protein and low net carbs, making it a delicious and easy support for a ketogenic lifestyle. Use KETOSYS™ as a meal replacement or snack to support your keto meal plan. 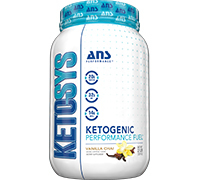 KETOSYS™ delivers a high fat meal using premium sources of fats designed for fast ketone energy: Coconut Oil (14g of MCTs), Flax Seed Oil as well as highly purified Lecithin providing several key phospholipids. Included amongst these phospholipids are phosphatidylcholine, phosphatidylserine as well as phophatidic acid. For protein, KETOSYS™ uses a blend of protein sources (whey isolate, milk protein isolate and micellar casein) to provide a sustained amino acid release and enhanced satiety for improved protein synthesis support. You need an easy to measure way to get in keto snacks or meals. Phospholipids include an incredible 2g dose of Phosphatidylcholine (supports liver function, fat digestion, memory, concentration, cellular integrity) as well as Phosphatidylserine (brain booster). High Quality Sustained Lean Protein Complex – Whey Isolate, Milk Protein Isolate and Micellar Casein – prolonged satiety and muscle feeding. Digestive enzymes to support rapid fat and protein digestion and absorption.